Legumain or asparagine endopeptidase is a unique cysteine endopeptidase with a distinctive specificity for the hydrolysis of peptide bonds after asparagine and to a lesser extent after aspartate. It is ubiquitously expressed in various tissues and besides its involvement in immune response and other physiological processes, it was also shown to play a role in pathological states such as inflammation and cancer. In order to improve our understanding of legumain substrate recognition we have performed proteomic profiling of legumain specificity on native proteins derived from MDA-MB-231 cells using two different N-terminal labelling methodologies (FPPS and ISIL). 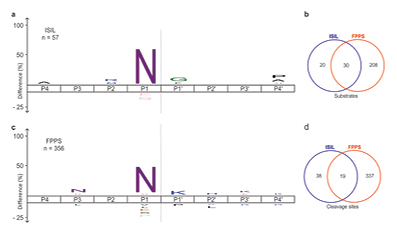 Our data revealed narrow cleavage specificity for P1 position combined with clear cleavage preference for unstructured secondary regions in the substrate proteins. No extended cleavage specificity on native proteins was observed. Moreover, a limited number of identified cleavages on individual substrates suggest its primary role in precision proteolysis and regulatory proteolytic events.